In looking for alternatives to Amazon, I’ve come across quite a few websites that are completely new to me. One of them is The Book Depository, a well-stocked online bookstore whose prices seem, so far, to be competitive with Amazon’s. The Book Depository has a nice feature called “Book Depository Live“, which allows you to see people buying books in (quasi) real time. 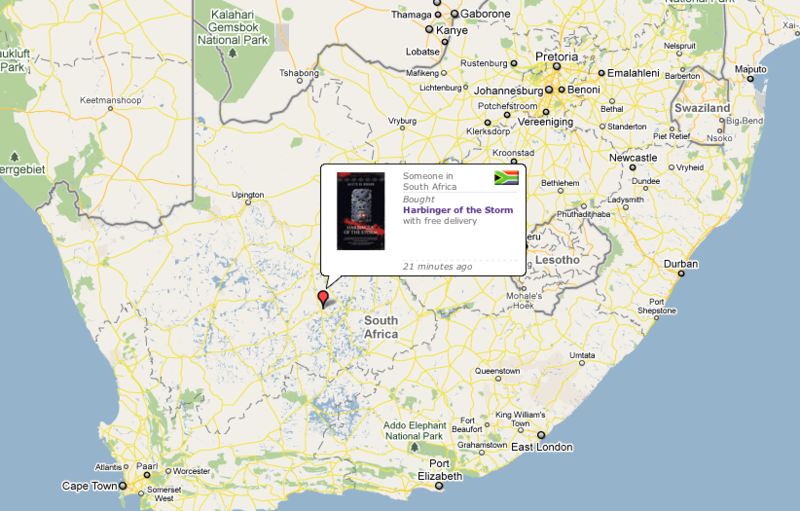 Using Google Maps, the feature scrolls across the globe to show you the buyer’s location and the purchased book’s title. If I could make a suggestion to the people behind this feature, it would be that the links to books should open in new tabs. That way you could click on a book that looks intriguing without being taken away from the map view. As it is, you need to hold Shift (or Cmd if you’re on a Mac) while clicking if you want to stay on the map. Despite this minor quibble, though, I like this feature. It reminds me of when Twitter was still new and visualisations of tweets superimposed on top of world maps were doing the rounds. Those projects were hypnotic but ultimately empty, because Twitter content suffers when isolated from conversational context. But in The Book Depository Live you might come across an interesting-looking book that you end up buying, and maybe being affected by in some way. I guess that’s something a book has over a tweet.